A desert is a barren area of landscape where little precipitation occurs and, consequently, living conditions are hostile for plant and animal life. The lack of vegetation exposes the unprotected surface of the ground to the processes of denudation. About one-third of the land surface of the world is arid or semi-arid. This includes much of the polar regions where little precipitation occurs and which are sometimes called polar deserts or “cold deserts”. Deserts can be classified by the amount of precipitation that falls, by the temperature that prevails, by the causes of desertification or by their geographical location. English desert and its Romance cognates (including Italian and Portuguese deserto, French désert and Spanish desierto) all come from the ecclesiastical Latin dēsertum (originally “an abandoned place”), a participle of dēserere, “to abandon”. The correlation between aridity and sparse population is complex and dynamic, varying by culture, era, and technologies; thus the use of the word desert can cause confusion. In English before the 20th century, desert was often used in the sense of “unpopulated area”, without specific reference to aridity; but today the word is most often used in its climate-science sense (an area of low precipitation). Phrases such as “desert island“ and “Great American Desert“, or Shakespeare‘s “deserts of Bohemia” (The Winter’s Tale) in previous centuries did not necessarily imply sand or aridity; their focus was the sparse population. Deserts have been defined and classified in a number of ways, generally combining total precipitation, number of days on which this falls, temperature, and humidity, and sometimes additional factors. 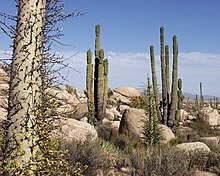 For example, Phoenix, Arizona, receives less than 250 mm (9.8 in) of precipitation per year, and is immediately recognized as being located in a desert because of its aridity-adapted plants. The North Slope of Alaska’s Brooks Range also receives less than 250 mm (9.8 in) of precipitation per year and is often classified as a cold desert. Other regions of the world have cold deserts, including areas of the Himalayas and other high-altitude areas in other parts of the world. Polar deserts cover much of the ice-free areas of the Arctic and Antarctic. A non-technical definition is that deserts are those parts of the Earth’s surface that have insufficient vegetation cover to support a human population. Deserts are sometimes classified as “hot” or “cold”, “semiarid” or “coastal”. 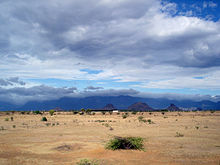 The characteristics of hot deserts include high temperatures in summer; greater evaporation than precipitation usually exacerbated by high temperatures, strong winds and lack of cloud cover; considerable variation in the occurrence of precipitation, its intensity and distribution; and low humidity. Winter temperatures vary considerably between different deserts and are often related to the location of the desert on the continental landmass and the latitude. Daily variations in temperature can be as great as 22 °C (40 °F) or more, with heat loss by radiation at night being increased by the clear skies. In some parts of the world, deserts are created by a rain shadow effect. Orographic lift occurs as air masses rise to pass over high ground. In the process they cool and lose much of their moisture by precipitation on the windward slope of the mountain range. When they descend on the leeward side, they warm and their capacity to hold moisture increases so an area with relatively little precipitation occurs. The Taklamakan Desert is an example, lying in the rain shadow of the Himalayas and receiving less than 38 mm (1.5 in) precipitation annually. Other areas are arid by virtue of being a very long way from the nearest available sources of moisture. Deserts usually have a large diurnal and seasonal temperature range, with high daytime temperatures falling sharply at night. The diurnal range may be as much as 20 to 30 °C (36 to 54 °F) and the rock surface experiences even greater temperature differentials. During the day the sky is usually clear and most of the sun‘s radiation reaches the ground, but as soon as the sun sets, the desert cools quickly by radiating heat into space. In hot deserts, the temperature during daytime can exceed 45 °C (113 °F) in summer and plunge below freezing point at night during winter. Deserts take up about one third of the Earth’s land surface. Bottomlands may be salt-covered flats. Eolian processes are major factors in shaping desert landscapes. 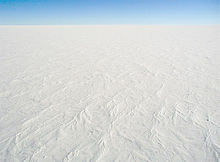 Polar deserts (also seen as “cold deserts”) have similar features, except the main form of precipitation is snow rather than rain. Antarctica is the world’s largest cold desert (composed of about 98% thick continental ice sheet and 2% barren rock). Some of the barren rock is to be found in the so-called Dry Valleys of Antarctica that almost never get snow, which can have ice-encrusted saline lakes that suggest evaporation far greater than the rare snowfall due to the strong katabatic winds that even evaporate ice. Deserts, both hot and cold, play a part in moderating the Earth’s temperature. This is because they reflect more of the incoming light and their albedo is higher than that of forests or the sea. A large part of the surface area of the world’s deserts consists of flat, stone-covered plains dominated by wind erosion. In “eolian deflation”, the wind continually removes fine-grained material, which becomes wind-blown sand. This exposes coarser-grained material, mainly pebbles with some larger stones or cobbles, leaving a desert pavement, an area of land overlaid by closely packed smooth stones forming a tessellated mosaic. Different theories exist as to how exactly the pavement is formed. It may be that after the sand and dust is blown away by the wind the stones jiggle themselves into place; alternatively, stones previously below ground may in some way work themselves to the surface. Very little further erosion takes place after the formation of a pavement, and the ground becomes stable. Evaporation brings moisture to the surface by capillary action and calcium salts may be precipitated, binding particles together to form a desert conglomerate. In time, bacteria that live on the surface of the stones accumulate a film of minerals and clay particles, forming a shiny brown coating known as desert varnish. Other non-sandy deserts consist of exposed outcrops of bedrock, dry soils or aridisols, and a variety of landforms affected by flowing water, such as alluvial fans, sinks or playas, temporary or permanent lakes, and oases. A hamada is a type of desert landscape consisting of a high rocky plateau where the sand has been removed by aeolian processes. Other landforms include plains largely covered by gravels and angular boulders, from which the finer particles have been stripped by the wind. These are called “reg” in the western Sahara, “serir” in the eastern Sahara, “gibber plains” in Australia and “saï” in central Asia. The Tassili Plateau in Algeria is an impressive jumble of eroded sandstone outcrops, canyons, blocks, pinnacles, fissures, slabs and ravines. In some places the wind has carved holes or arches, and in others, it has created mushroom-like pillars narrower at the base than the top. In the Colorado Plateau it is water that has been the eroding force. Here the Colorado River has cut its way over the millennia through the high desert floor creating a canyon that is over a mile (6,000 feet or 1,800 meters) deep in places, exposing strata that are over two billion years old. Atacama, the world’s driest non-polar desert, part of the Arid Diagonal of South America. When rain falls in deserts, as it occasionally does, it is often with great violence. The desert surface is evidence of this with dry stream channels known as arroyos or wadis meandering across its surface. These can experience flash floods, becoming raging torrents with surprising rapidity after a storm that may be many kilometers away. Most deserts are in basins with no drainage to the sea but some are crossed by exotic rivers sourced in mountain ranges or other high rainfall areas beyond their borders. The River Nile, the Colorado River and the Yellow River do this, losing much of their water through evaporation as they pass through the desert and raising groundwater levels nearby. There may also be underground sources of water in deserts in the form of springs, aquifers, underground rivers or lakes. Where these lie close to the surface, wells can be dug and oases may form where plant and animal life can flourish. The Nubian Sandstone Aquifer System under the Sahara Desert is the largest known accumulation of fossil water. The Great Man-Made River is a scheme launched by Libya’s Colonel Gadaffi to tap this aquifer and supply water to coastal cities. Kharga Oasis in Egypt is 150 km (93 mi) long and is the largest oasis in the Libyan Desert. A lake occupied this depression in ancient times and thick deposits of sandy-clay resulted. Wells are dug to extract water from the porous sandstone that lies underneath. Seepages may occur in the walls of canyons and pools may survive in deep shade near the dried up watercourse below. Many desert plants have reduced the size of their leaves or abandoned them altogether. Cacti are desert specialists, and in most species, the leaves have been dispensed with and the chlorophyll displaced into the trunks, the cellular structure of which has been modified to allow them to store water. When rain falls, the water is rapidly absorbed by the shallow roots and retained to allow them to survive until the next downpour, which may be months or years away. The giant saguaro cacti of the Sonoran Desert form “forests”, providing shade for other plants and nesting places for desert birds. Saguaro grows slowly but may live for up to two hundred years. The surface of the trunk is folded like a concertina, allowing it to expand, and a large specimen can hold eight tons of water after a good downpour. Some desert plants produce seed which lies dormant in the soil until sparked into growth by rainfall. When annuals, such plants grow with great rapidity and may flower and set seed within weeks, aiming to complete their development before the last vestige of water dries up. For perennial plants, reproduction is more likely to be successful if the seed germinates in a shaded position, but not so close to the parent plant as to be in competition with it. Some seed will not germinate until it has been blown about on the desert floor to scarify the seed coat. The seed of the mesquite tree, which grows in deserts in the Americas, is hard and fails to sprout even when planted carefully. When it has passed through the gut of a pronghorn it germinates readily, and the little pile of moist dung provides an excellent start to life well away from the parent tree. The stems and leaves of some plants lower the surface velocity of sand-carrying winds and protect the ground from erosion. Even small fungi and microscopic plant organisms found on the soil surface (so-called cryptobiotic soil) can be a vital link in preventing erosion and providing support for other living organisms. Cold deserts often have high concentrations of salt in the soil. Grasses and low shrubs are the dominant vegetation here and the ground may be covered with lichens. Most shrubs have spiny leaves and shed them in the coldest part of the year. Water and carbon dioxide are metabolic end products of oxidation of fats, proteins, and carbohydrates. Oxidising a gram of carbohydrate produces 0.60 grams of water; a gram of protein produces 0.41 grams of water; and a gram of fat produces 1.07 grams of water, making it possible for xerocoles to live with little or no access to drinking water. The kangaroo rat for example makes use of this water of metabolism and conserves water both by having a low basal metabolic rate and by remaining underground during the heat of the day, reducing loss of water through its skin and respiratory system when at rest. Herbivorous mammals obtain moisture from the plants they eat. Species such as the addax antelope, dik-dik, Grant’s gazelle and oryx are so efficient at doing this that they apparently never need to drink. The camel is a superb example of a mammal adapted to desert life. It minimizes its water loss by producing concentrated urine and dry dung, and is able to lose 40% of its body weight through water loss without dying of dehydration. Carnivores can obtain much of their water needs from the body fluids of their prey. Many other hot desert animals are nocturnal, seeking out shade during the day or dwelling underground in burrows. At depths of more than 50 cm (20 in), these remain at between 30 to 32 °C (86 to 90 °F) regardless of the external temperature. Jerboas, desert rats, kangaroo rats and other small rodents emerge from their burrows at night and so do the foxes, coyotes, jackals and snakes that prey on them. Kangaroos keep cool by increasing their respiration rate, panting, sweating and moistening the skin of their forelegs with saliva. Mammals living in cold deserts have developed greater insulation through warmer body fur and insulating layers of fat beneath the skin. The arctic weasel has a metabolic rate that is two or three times as high as would be expected for an animal of its size. Birds have avoided the problem of losing heat through their feet by not attempting to maintain them at the same temperature as the rest of their bodies, a form of adaptive insulation. The emperor penguin has dense plumage, a downy under layer, an air insulation layer next the skin and various thermoregulatory strategies to maintain its body temperature in one of the harshest environments on Earth. Amphibians might seem unlikely desert-dwellers, because of their need to keep their skins moist and their dependence on water for reproductive purposes. In fact, the few species that are found in this habitat have made some remarkable adaptations. Most of them are fossorial, spending the hot dry months aestivating in deep burrows. While there they shed their skins a number of times and retain the remnants around them as a waterproof cocoon to retain moisture. In the Sonoran Desert, Couch’s spadefoot toad spends most of the year dormant in its burrow. Heavy rain is the trigger for emergence and the first male to find a suitable pool calls to attract others. Eggs are laid and the tadpoles grow rapidly as they must reach metamorphosis before the water evaporates. As the desert dries out, the adult toads rebury themselves. The juveniles stay on the surface for a while, feeding and growing, but soon dig themselves burrows. Few make it to adulthood. The water holding frog in Australia has a similar life cycle and may aestivate for as long as five years if no rain falls. The Desert rain frog of Namibia is nocturnal and survives because of the damp sea fogs that roll in from the Atlantic. Invertebrates, particularly arthropods, have successfully made their homes in the desert. Flies, beetles, ants, termites, locusts, millipedes, scorpions and spiders have hard cuticles which are impervious to water and many of them lay their eggs underground and their young develop away from the temperature extremes at the surface. The Saharan silver ant (Cataglyphis bombycina) uses a heat shock protein in a novel way and forages in the open during brief forays in the heat of the day. The long-legged darkling beetle in Namibia stands on its front legs and raises its carapace to catch the morning mist as condensate, funnelling the water into its mouth. Some arthropods make use of the ephemeral pools that form after rain and complete their life cycle in a matter of days. The desert shrimp does this, appearing “miraculously” in new-formed puddles as the dormant eggs hatch. Others, such as brine shrimps, fairy shrimps and tadpole shrimps, are cryptobiotic and can lose up to 92% of their bodyweight, rehydrating as soon as it rains and their temporary pools reappear. Deserts contain substantial mineral resources, sometimes over their entire surface, giving them their characteristic colors. For example, the red of many sand deserts comes from laterite minerals. Geological processes in a desert climate can concentrate minerals into valuable deposits. Leaching by ground water can extract ore minerals and redeposit them, according to the water table, in concentrated form. Similarly, evaporation tends to concentrate minerals in desert lakes, creating dry lake beds or playas rich in minerals. Evaporation can concentrate minerals as a variety of evaporite deposits, including gypsum, sodium nitrate, sodium chloride and borates. Evaporites are found in the USA’s Great Basin Desert, historically exploited by the “20-mule teams” pulling carts of borax from Death Valley to the nearest railway. 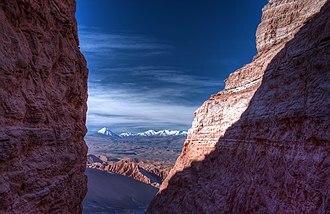 A desert especially rich in mineral salts is the Atacama Desert, Chile, where sodium nitrate has been mined for explosives and fertilizer since around 1850. Other desert minerals are copper from Chile, Peru, and Iran, and iron and uranium in Australia. Many other metals, salts and commercially valuable types of rock such as pumice are extracted from deserts around the world. Oil and gas form on the bottom of shallow seas when micro-organisms decompose under anoxic conditions and later become covered with sediment. Many deserts were at one time the sites of shallow seas and others have had underlying hydrocarbon deposits transported to them by the movement of tectonic plates. Some major oilfields such as Ghawar are found under the sands of Saudi Arabia. Geologists believe that other oil deposits were formed by aeolian processes in ancient deserts as may be the case with some of the major American oil fields. A modern example of desert farming is the Imperial Valley in California, which has high temperatures and average rainfall of just 3 in (76 mm) per year. The economy is heavily based on agriculture and the land is irrigated through a network of canals and pipelines sourced entirely from the Colorado River via the All-American Canal. The soil is deep and fertile, being part of the river’s flood plains, and what would otherwise have been desert has been transformed into one of the most productive farming regions in California. Other water from the river is piped to urban communities but all this has been at the expense of the river, which below the extraction sites no longer has any above-ground flow during most of the year. Another problem of growing crops in this way is the build-up of salinity in the soil caused by the evaporation of river water. The greening of the desert remains an aspiration and was at one time viewed as a future means for increasing food production for the world’s growing population. This prospect has proved false as it disregarded the environmental damage caused elsewhere by the diversion of water for desert project irrigation. The potential for generating solar energy from the Sahara Desert is huge, the highest found on the globe. Professor David Faiman of Ben-Gurion University has stated that the technology now exists to supply all of the world’s electricity needs from 10% of the Sahara Desert. Desertec Industrial Initiative was a consortium seeking $560 billion to invest in North African solar and wind installations over the next forty years to supply electricity to Europe via cable lines running under the Mediterranean Sea. European interest in the Sahara Desert stems from its two aspects: the almost continual daytime sunshine and plenty of unused land. The Sahara receives more sunshine per acre than any part of Europe. The Sahara Desert also has the empty space totalling hundreds of square miles required to house fields of mirrors for solar plants. The Negev Desert, Israel, and the surrounding area, including the Arava Valley, receive plenty of sunshine and are generally not arable. This has resulted in the construction of many solar plants. David Faiman has proposed that “giant” solar plants in the Negev could supply all of Israel’s needs for electricity. Many centuries later, both world wars saw fighting in the desert. In the First World War, the Ottoman Turks were engaged with the British regular army in a campaign that spanned the Arabian peninsula. The Turks were defeated by the British, who had the backing of irregular Arab forces that were seeking to revolt against the Turks in the Hejaz, made famous in T.E. Lawrence‘s book Seven Pillars of Wisdom. There is an extensive literature on the subject of deserts. An early historical account is that of Marco Polo (c. 1254–1324), who travelled through Central Asia to China, crossing a number of deserts in his twenty four year trek. Some accounts give vivid descriptions of desert conditions, though often accounts of journeys across deserts are interwoven with reflection, as is the case in Charles Montagu Doughty‘s major work, Travels in Arabia Deserta (1888). Antoine de Saint-Exupéry described both his flying and the desert in Wind, Sand and Stars and Gertrude Bell travelled extensively in the Arabian desert in the early part of the 20th century, becoming an expert on the subject, writing books and advising the British government on dealing with the Arabs. Another woman explorer was Freya Stark who travelled alone in the Middle East, visiting Turkey, Arabia, Yemen, Syria, Persia and Afghanistan, writing over twenty books on her experiences. The German naturalist Uwe George spent several years living in deserts, recording his experiences and research in his book, In the Deserts of this Earth. ^ a b Harper, Douglas (2012). “Desert”. Online Etymology Dictionary. Retrieved 2013-05-12. ^ “Desert”. The Free Dictionary. Farlex. Retrieved 2013-05-12. ^ “Desert Island”. The Free Dictionary. Farlex. Retrieved 2013-05-12. ^ “Precipitation and evapotranspiration” (PDF). Routledge. Retrieved 19 October 2017. ^ a b Smith, Jeremy M. B. “Desert”. Encyclopædia Britannica online. Retrieved 2013-09-24. ^ a b c d “What is a desert?”. United States Geological Survey. Retrieved 2013-05-23. ^ Walter, Heinrich; Breckle, Siegmar-W. (2002). Walter’s Vegetation of the Earth: The Ecological Systems of the Geo-biosphere. Springer. p. 457. ISBN 978-3-540-43315-6. ^ a b “Desert”. 1911 Encyclopædia Britannica, Volume 8. 1911. p. 93. Retrieved 2013-09-24. ^ Buel, S.W. (1964). “Calculated actual and potential evapotranspiration in Arizona”. Tucson, Arizona University Agricultural Experiment Station Technical Bulletin. 162: 48. ^ Mendez, J.; Hinzman, L.D. ; Kane, D.L. (1998). “Evapotranspiration from a wetland complex on the Arctic coastal plain of Alaska”. Nordic Hydrology. 29 (4–5): 303–330. doi:10.2166/nh.1998.0020. ISSN 0029-1277. ^ “Semiarid Desert”. The Desert. ^ “Semiarid – Climate Types for Kids”. sites.google.com. ^ a b c d “Types of deserts”. Deserts: Geology and Resources. United States Geological Survey. Retrieved 2013-05-11. ^ “The formation of deserts”. Desert. Oracle ThinkQuest Education Foundation. Archived from the original on 2012-10-17. Retrieved 2013-05-11. ^ Brinch, Brian (2007-11-01). “How mountains influence rainfall patterns”. USA Today. Retrieved 2013-05-08. ^ “Taklamakan Desert”. Encyclopædia Britannica online. Retrieved 2007-08-11. ^ Pidwirny, Michael (2008). “CHAPTER 8: Introduction to the Hydrosphere (e) Cloud Formation Processes”. Physical Geography. Archived from the original on 2008-12-20. Retrieved 2009-01-01. ^ Bockheim, J.G. (2002). “Landform and soil development in the McMurdo Dry Valleys, Antarctica: a regional synthesis”. Arctic, Antarctic, and Alpine Research. 34 (3): 308–317. doi:10.2307/1552489. JSTOR 1552489. ^ Allaby, Michael (2004). “Thornthwaite climate classification”. A Dictionary of Ecology. Encyclopedia.com. Retrieved 2013-09-23. ^ Smalley, I. J.; Vita-Finzi, C. (1968). “The formation of fine particles in sandy deserts and the nature of ‘desert’ loess”. Journal of Sedimentary Petrology. 38 (3): 766–774. doi:10.1306/74d71a69-2b21-11d7-8648000102c1865d. ^ a b Yang, Youlin; Squires, Victor; Lu, Qi, eds. (2001). “Physics, Mechanics and Processes of Dust and Sandstorms” (PDF). Global Alarm: Dust and Sandstorms from the World’s Drylands. United Nations Convention to Combat Desertification. p. 17. ^ Gu, Yingxin; Rose, William I.; Bluth, Gregg J.S. (2003). “Retrieval of mass and sizes of particles in sandstorms using two MODIS IR bands: A case study of April 7, 2001 sandstorm in China”. Geophysical Research Letters. 30 (15): 1805. Bibcode:2003GeoRL..30.1805G. doi:10.1029/2003GL017405. ^ Sinclair, Peter C. (1969). “General characteristics of dust devils”. Journal of Applied Meteorology. 8 (1): 32–45. Bibcode:1969JApMe…8…32S. doi:10.1175/1520-0450(1969)008<0032:GCODD>2.0.CO;2. ^ Zheng, Xiao Jing; Huang, Ning; Zhou, You-He (2003). “Laboratory measurement of electrification of wind-blown sands and simulation of its effect on sand saltation movement”. Journal of Geophysical Research: Atmospheres. 108 (D10): 4322. Bibcode:2003JGRD..108.4322Z. doi:10.1029/2002JD002572. ^ Latham, J. (1964). “The electrification of snowstorms and sandstorms” (PDF). Quarterly Journal of the Royal Meteorological Society. 90 (383): 91–95. Bibcode:1964QJRMS..90…91L. doi:10.1002/qj.49709038310. Archived from the original (PDF) on 2013-12-02. ^ “The World’s Largest Deserts”. Geology.com. Retrieved 2013-05-12. ^ “Misconceptions surround desert terrain, vegetation”. Ask a Scientist. Cornell Center for Materials Research. 2001-07-11. Retrieved 2013-09-24. ^ “Habitats: Desert”. BBC Nature. 2013. Retrieved 2013-05-23. ^ a b c d e f “Desert Features”. United States Geological Survey. 1997-10-29. Retrieved 2013-05-23. ^ “Sand Plains/Sand Sheets”. Desert Guide. US Army Corps of Engineers. Archived from the original on 2010-04-20. Retrieved 2013-05-23. ^ “Ripples, Sand”. Desert Guide. US Army Corps of Engineers. Archived from the original on 2010-02-26. Retrieved 2013-05-23. ^ “Dunes, General”. Desert Guide. US Army Corps of Engineers. Archived from the original on 2010-11-23. Retrieved 2013-05-23. ^ a b “Types of Dunes”. United States Geological Survey. 1997-10-29. Retrieved 2013-05-23. ^ “Desert pavement”. Encyclopædia Britannica online. Retrieved 2013-05-23. ^ Perry, R.S. ; Adams, J.B. (1978). “Desert varnish: evidence for cyclic deposition of manganese” (PDF). Nature. 276 (5687): 489–491. Bibcode:1978Natur.276..489P. doi:10.1038/276489a0. Archived from the original (PDF) on 2013-10-03. ^ “Hamada, Reg, Serir, Gibber, Saï”. Springer Reference. 2013. Retrieved 2013-05-23. ^ Foos, Annabelle. “Geology of Grand Canyon National Park, North Rim” (PDF). Retrieved 2013-09-24. ^ a b Westbeld, A.; Klemm, O.; Grießbaum, F.; Strater, E.; Larrain, H.; Osses, P.; Cereceda, P. (2009). “Fog deposition to a Tillandsia carpet in the Atacama Desert”. Annales Geophysicae. 27 (9): 3571–3576. Bibcode:2009AnGeo..27.3571W. doi:10.5194/angeo-27-3571-2009. ^ “Even the Driest Place on Earth Has Water”. Extreme Science. Retrieved 2 April 2013. ^ Mckay, Christopher P. (May–June 2002). “Two dry for life: the Atacama Desert and Mars” (PDF). AdAstra: 30–33. Archived from the original (PDF) on 2009-08-26. ^ Jonathan Amos (8 December 2005). “Chile desert’s super-dry history”. BBC News. Retrieved 29 December 2009. ^ McKay, C.P. (May–June 2002). “Too dry for life: The Atacama Desert and Mars” (PDF). Ad Astra: 30. Archived from the original (PDF) on 2009-08-26. Retrieved 2010-10-16. ^ Preston, Benjamin (2011-04-01). “Colonel Qaddafi and the Great Man-made River”. State of the Planet. Earth Institute: Columbia University. Retrieved 2013-10-02. ^ Bayfield, Su (2011). “Introduction to Kharga Oasis”. Egyptian monuments. Retrieved 2013-10-02. ^ “Desert Survival”. Public Broadcasting Service. Retrieved 2010-10-16. ^ “Lake Bonneville”. Utah Geological Survey. Retrieved 2013-05-24. ^ Osborne, Colin P.; Beerling, David J. (2006). “Nature’s green revolution: the remarkable evolutionary rise of C4 plants”. Philosophical Transactions of the Royal Society B. 361 (1465): 173–194. doi:10.1098/rstb.2005.1737. ISSN 1471-2970. PMC 1626541. PMID 16553316. ^ Council-Garcia, Cara Lea (2002). “Plant adaptations”. University of New Mexico. Archived from the original on 2015-01-04. Retrieved 2013-09-24. ^ a b “Desert Flora” (PDF). Australian Department of the Environment and Heritage. Archived from the original (PDF) on 2013-04-26. Retrieved 2013-05-13. ^ Dimmitt, Mark A. (1997). “How Plants Cope with the Desert Climate”. Arizona-Sonora Desert Museum. Retrieved 2013-05-13. ^ “Cold Deserts”. The desert biome. University of California Museum of Paleontology. 1996. Retrieved 2013-09-23. ^ a b Scholander, P.F. ; Hock, Raymond; Walters, Vladimir; Irving, Laurence (1950). “Adaptation to cold in arctic and tropical mammals and birds in relation to body temperature, insulation, and basal metabolic rate”. Biological Bulletin. 50 (2): 269. ^ Al-kahtani, M.A. ; C. Zuleta; E. Caviedes-Vidal; T. Garland, Jr. (2004). “Kidney mass and relative medullary thickness of rodents in relation to habitat, body size, and phylogeny” (PDF). Physiological and Biochemical Zoology. 77 (3): 346–365. CiteSeerX 10.1.1.407.8690. doi:10.1086/420941. PMID 15286910. ^ Pianka, Eric R. “Convergent Evolution”. Biology Reference. Retrieved 2013-05-28. ^ Morrison, S.D. (1953). “A method for the calculation of metabolic water”. Journal of Physiology. 122 (2): 399–402. doi:10.1113/jphysiol.1953.sp005009. PMC 1366125. PMID 13118549. Morrison cites Brody, S. Bioenergetics and Growth. Reinhold, 1945. p. 36 for the figures. ^ a b Mellanby, Kenneth (1942). “Metabolic water and desiccation”. Nature. 150 (3792): 21. Bibcode:1942Natur.150…21M. doi:10.1038/150021a0. ISSN 0028-0836. ^ Best T.L. ; et al. (1989). “Dipodomys deserti” (PDF). Mammalian Species. 339 (339): 1–8. doi:10.2307/3504260. JSTOR 3504260. Archived from the original (PDF) on 2014-12-16. Retrieved 2014-04-22. ^ Maloiy, G.M.O. (November 1973). “The water metabolism of a small East African antelope: the dik-dik”. Proceedings of the Royal Society B. 184 (1075): 167–178. Bibcode:1973RSPSB.184..167M. doi:10.1098/rspb.1973.0041. JSTOR 76120. PMID 4148569. ^ Vann Jones, Kerstin. “What secrets lie within the camel’s hump?”. Lund University. Retrieved 2013-05-21. ^ Monroe, M.H. “The Red Kangaroo”. Australia: The Land Where Time Began. Retrieved 2013-10-03. ^ Hile, J. (2004-03-29). “Emperor Penguins: Uniquely Armed for Antarctica”. National Geographic. Retrieved 2013-10-02. ^ “Couch’s spadefoot (Scaphiopus couchi)”. Arizona-Sonora Desert Museum. Retrieved 2013-05-21. ^ Withers, P.C. (1993). “Metabolic Depression During Estivation in the Australian Frogs, Neobatrachus and Cyclorana“. Australian Journal of Zoology. 41 (5): 467–473. doi:10.1071/ZO9930467. ^ Castillo, Nery (2011-06-23). “Breviceps macrops“. AmphibiaWeb. Retrieved 2012-10-20. ^ “Invertebrates: A Vertebrate Looks at Arthropods”. Arizona-Sonora Desert Museum. Retrieved 2013-05-21. ^ “Invertebrates in the Desert”. ThinkQuest. Oracle. Archived from the original on 2013-05-20. Retrieved 2013-05-22. ^ Moseley, Pope L. (1997). “Heat shock proteins and heat adaptation of the whole organism”. Journal of Applied Physiology. 83 (5): 1413–1417. doi:10.1152/jappl.1997.83.5.1413. PMID 9375300. ^ “Ephemeral Pools”. Arches National Park, Utah. National Park Service. Retrieved 2013-05-22. ^ a b c d e f g h “Mineral Resources in Deserts”. US Geological Survey. 1997-10-29. Retrieved 2013-05-24. ^ a b Waldoks, Ehud Zion (2008-03-18). “Head of Kibbutz Movement: We will not be discriminated against by the government”. The Jerusalem Post. Retrieved 2013-09-22. ^ Dyson-Hudson, Rada; Dyson-Hudson, Neville (1980). “Nomadic pastoralism”. Annual Review of Anthropology. 9: 15–61. doi:10.1146/annurev.an.09.100180.000311. JSTOR 2155728. ^ Masonen, Pekka (1995). “Trans-Saharan trade and the West African discovery of the Mediterranean”. Nordic Research on the Middle East. 3: 116–142. Archived from the original on 2013-05-28. ^ “Sahara salt trade camel caravans”. National Geographic News. 2010-10-28. Archived from the original on 2013-09-27. Retrieved 2013-09-22. ^ “First Measured Century: Interview:James Gregory”. Public Broadcasting Service. Retrieved 2013-05-25. ^ “Desertification: Facts and figures”. United Nations. Retrieved 2013-05-26. ^ Anderson, Roger N. (2006-01-16). “Why is oil usually found in deserts and Arctic areas?”. Scientific American. Retrieved 2013-05-26. ^ a b c Marasco, Ramona; Rolli, Eleonora; Ettoumi, Besma; Vigani, Gianpiero; Mapelli, Francesca; Borin, Sara; Abou-Hadid, Ayman F.; El-Behairy, Usama A.; Sorlini, Claudia; Cherif, Ameur; Zocchi, Graziano; Daffonchio, Daniele (2012). “A drought resistance-promoting microbiome is selected by root system under desert farming”. PLOS ONE. 7 (10): e48479. Bibcode:2012PLoSO…748479M. doi:10.1371/journal.pone.0048479. PMC 3485337. PMID 23119032. ^ Stager, Lawrence E. (1976). “Farming in the Judean Desert during the Iron Age”. Bulletin of the American Schools of Oriental Research. 221 (221): 145–158. doi:10.2307/1356097. JSTOR 1356097. ^ Smith, Chuck (2002-10-14). “Agricultural Societies In Pre-European Times: Southwestern U.S. and Northwestern Mexico”. Native Peoples of North America. Retrieved 2013-09-28. ^ “Imperial County Agriculture”. University of California Cooperative Extension. 2012-02-15. Retrieved 2013-09-28. ^ Meadows, Robin (2012). “Research news: UC Desert Research and Extension Center celebrates 100 years”. California Agriculture. 66 (4): 122–126. doi:10.3733/ca.v066n04p122. ^ “5 of the World’s Biggest Solar Energy Plants”. Tech.Co. 2015-05-03. Retrieved 2019-01-02. ^ Parry, Tom (2007-08-15). “Looking to the sun”. Canadian Broadcasting Corporation. Retrieved 2013-09-22. ^ a b Lettice, John (2008-01-25). “Giant solar plants in Negev could power Israel’s future”. The Register. Retrieved 2013-09-22. ^ Matlack, Carol (2010-12-16). “Sahara Solar Energy Could Power Europe”. BloombergBusinessweek. Bloomberg. Retrieved 2013-09-22. ^ Fratini, Dan (2006). “The Battle Of Yarmuk, 636”. MilitaryHistoryOnline.com. Retrieved 2014-11-29. ^ Woolley, Jo (2008). “Desert warfare”. History Today. 52 (10). ^ “Writing the Void: Desert Literature”. University of Strathclyde. Archived from the original on 2013-09-28. Retrieved 2013-09-24. ^ Taylor, Andrew (1999). God’s Fugitive. Harper Collins. pp. 295–298. ISBN 978-0-00-255815-0. ^ Hutchinson, Charles F. (1994). “Wind, Sand and Stars Revisited”. Retrieved 2013-05-26. ^ Frost, Robert. “Desert Places”. Poemhunter. Retrieved 2013-05-26. ^ “Strange Land Formations on Mars”. The Blue Bird Files. 2007-04-11. Retrieved 2013-09-27. 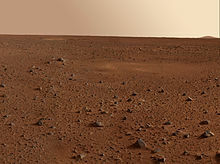 ^ “Do Mars Rocks Have Desert Varnish?”. Astrobiology. 2013-03-23. Retrieved 2013-09-27. ^ Arnold, K.; Radebaugh, J.; Savage, C.J. ; Turtle, E.P. ; Lorenz, R.D. ; Stofan, E.R. ; Le-Gall, A. (2011). “Areas of Sand Seas on Titan from Cassini Radar and ISS: Fensal and Aztlan” (PDF). 42nd Lunar and Planetary Science Conference, March 7–11, 2011 at the Woodlands, Texas. LPI Contribution No. 1608 (1608): 2804. Bibcode:2011LPI….42.2804A. Bagnold, Ralph A. (1941). “The physics of blown sand and desert dunes”. Nature. 148 (3756): 480–481. Bibcode:1941Natur.148..480H. doi:10.1038/148480a0. “Global Deserts Outlook”. United Nations Environment Programme (UNEP). 2006. Archived from the original on 2006-06-16. , a report in the Global Environment Outlook (GEO) series.